City Square off is a two-player game from Gamewright Games that puts players in a head to head competition of of city planning. You will immediately note that this is not a very good simulation of city planning, as it plays out in about 15-20 minutes, and involves no mechanics for planning committees, public hearings, budgeting sessions, or zoning. As much as I love planning committees, I think is safe to say that is probably for the best. 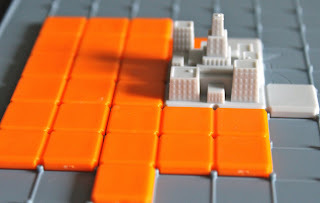 In the box you will find two 9x9 gridded player boards, two sets of 21 "cityscape" pieces in various tetris-like shapes, four starter pieces in the shape of buildings, and a deck of cards that match each of the 21 cityscape pieces. 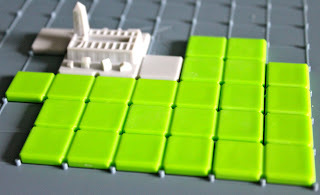 The gameplay is very straight forward; players will each pick a starting building, each with a unique footprint and place it approximately in the center of their boards. From there, a card from the deck is flipped, and players will simultaneously place the cityscape piece coresponding with the card on their player board. 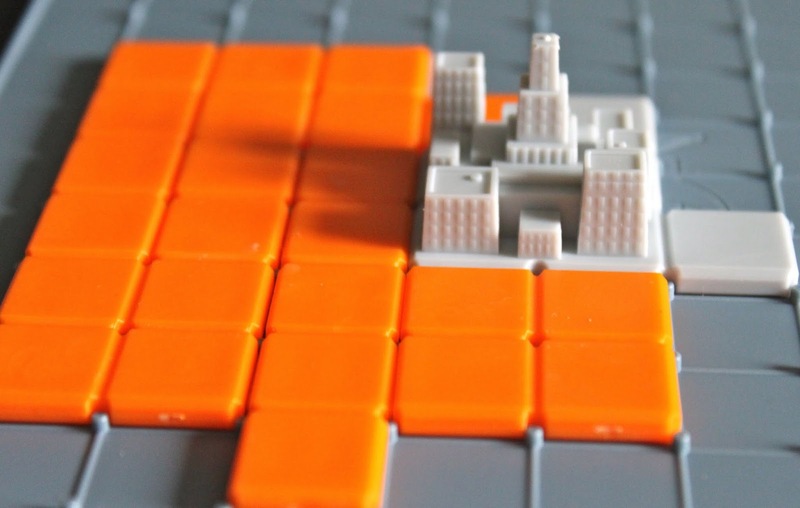 The cityscape pieces must touch at least one previously played piece, and must fit onto the 9x9 board. If a player can't fit a piece on their board, then they loose. 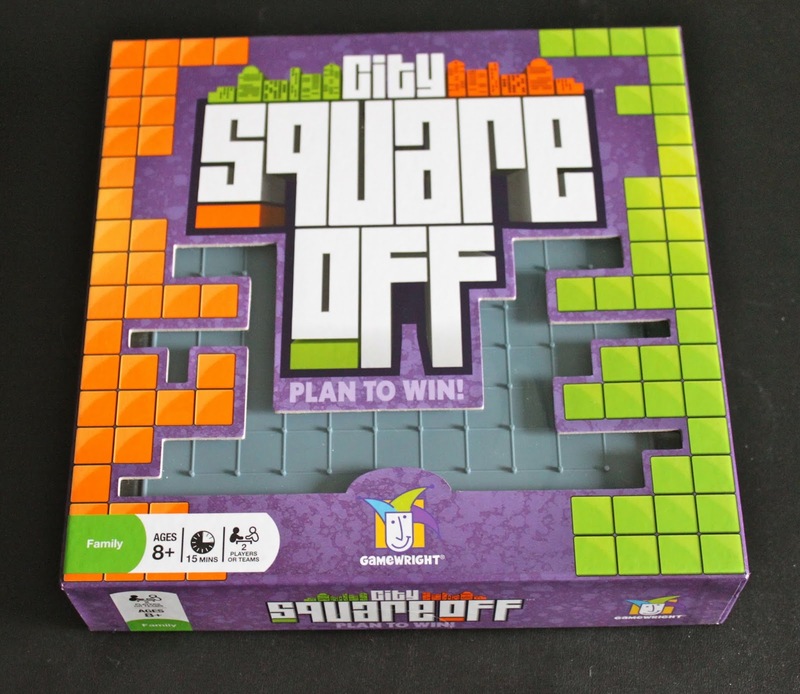 If both players can't fit a piece on their board, then the player with the largest unused space wins. And thats it really. It's fast and fun, allowing for plenty of gameplay. As far as tile-placement games go, it has enough uniqueness going on for it that you can't really compare it to games like Blokus. We played this several times over the past week, and each time presenting new and different problems. Because of the deck, there is no one key strategy to go off of, and each of the starting buildings unique footprint means that you can't copy your opponent either. While it is designed as a two-player game, it easily can be played as a single player game as well since each player has their own board. Granted, playing solo will not be as desirable an accomplishment when applying for city planner and they see this on your resume. They usually are looking for accomplished planners, and will be looking for people with a solid two-player career. You scooped me! I'm planning on playing this over the weekend. I'm glad to hear that it's a solid title - I didn't really know much about it. Thanks for the review! Ha, whoops. I've found that GameWright for the most part consistently puts out quality engaging games for all levels. Always impressed with their stuff. This one and Flip Out are definitely my favorites for this years games from them.